Norton Folgate, The Fight Is On Again! 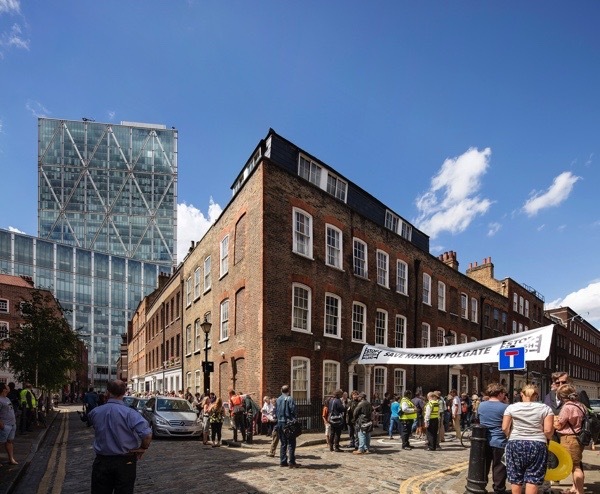 At a meeting on Tuesday night, the Spitalfields Trust decided to go to the Court of Appeal to challenge the verdict delivered by Justice Gilbart on Monday in favour of the Mayor of London and against the Trust in their campaign to prevent British Land destroying Norton Folgate. There is a consensus that the Judge’s confirmation of the mishandling of the Mayor’s call-in of the Norton Folgate planning application cannot be squared with his conclusion that the Mayor’s decision to approve the development is legitimate. What kind of justice is it to confirm that powerful people can break the rules and get away with it? You have to ask yourself at which point such mishandling becomes abuse of power. In their official statement (issued yesterday and published below) the Spitalfields Trust chose to widen their challenge by questioning the partial nature of the Mayor’s call-in whereby the GLA planning officers wrote their recommendations to suit the predetermined decision, emphasising the supposed benefits of the development and neglecting other factors. This is termed the ‘poisoning of the well’ issue and it brings the entire process into disrepute. The notion that a Mayor of London who calls himself the ‘friend of developers’ should have the power to overrule planning decisions made democratically by local authorities is questionable. When this same Mayor stages a hearing and planning officers write reports to confirm his predetermined outcome this is highly questionable. When Justice Gilbart chose the opportunity of delivering his verdict to declare that it ‘warmed the cockles of his heart’ to read Boris Johnson’s words in the transcript of the hearing, this suggests a cosy level of flippant complacency which is also questionable. The Spitalfields Trust is naturally disappointed at the outcome of the Judicial Review. However there is more to this than the simple ruling: there is the full text of Mr Justice Gilbart’s judgment to consider. This reveals that, in significant respects, the position taken by the Trust has been advanced. It is now definitively established that errors were made by the GLA on all four of the the Trust’s grounds – on the impact of Crossrail, on the cross-boundary effects of Crossrail, on the failure to take account of the Trust’s representations on the statutory criteria for Mayoral intervention, on the premature sending of an email confirming the planning officer’s recommendation. The judgment establishes that a series of errors were made, with wider implications for the Mayor of London’s handling of planning applications. There is the matter of the weight that should be given to these mistakes – and the judge considered that each of these errors would not have made a difference to the take-over decision. The Trust disagrees. It contends that the errors need to be considered in their totality, and their significance tested by the Court of Appeal. That the misunderstanding of the criteria which has been identified in respect of Crossrail point to mistakes in identifying economic impacts and effects. That significant impacts needed to be addressed across the London Plan as a whole and that the Mayor failed to do so. That, having told the developer what the recommendation would be before reading statutorily relevant material, officers then wrote a report which was relentlessly supportive of the recommendation, omitting any arguments that the first two statutory criteria were not met. That officers who proceed on the basis of ‘recommendation first, evidence second’ and who privately tell the developer what they will – not might – say cannot be relied upon when they misreport the contrary view and make substantive errors. The judge did not grapple with this ‘poisoning of the well’ issue. I salute the tenacity of the Spitalfields trust, whatever the outcome no one could ever accuse the trust of not trying, GOOD LUCK. I’m glad to see that the Spitalfields Trust is challenging the legitimacy of this ruling. Fight on! GREAT NEWS. A big THANK YOU to those who are continuing the fight. & GOOD LUCK. i work in the heritage area in perth, western australia, and fully support your argument. i have fallen in love with spitalfields as a result of your blog and will be making it a priority to visit next time i am in london. the spirit of John Betjeman must be cheering you on with tea, gin and pithy lines of verse. In your post earlier in the week, there was a bright rainbow behind Hawksmoor’s church. Let’s hope this is a blessing and a sign that goodwill and concern for the preservation of Norton Folgate will prevail. Try to persuade the new Mayor to rescind his predecessor’s decision? Excellent news. This overriding of conservation areas and local democratic decisions must stop! A cause worth fighting for – not just for Spitalfields but for the whole issue of things like this being allowed to happen. Hoping the NEW Mayor will have more wisdom and grace than the last one! Do not give up the fight – losing one skirmish doesn’t mean the war is over and we are beaten. Keep going Spitalfields Trust !!! 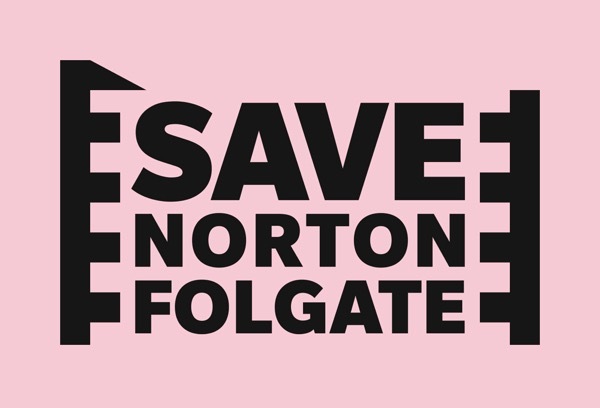 Norton Folgate will be saved ! Well done. The Trust has my full support. Yes,ditto the bravo! I’m so glad to hear there is still a chance that the “indigenous” people may prevail and their way of life respected! Thank you Spitalsfield Trust for your perseverance and Gentle Author for rallying global support. Tremendous tenacity and guts from the Spitalfields Trsust! Very heartening. Here’s to them whatever happens next. what was that inappropriate comment about the mayor’s testimony warming the cockles of his heart? i thought that was very strange. anyway, please do keep us posed, i believe you and the trust are right on. When will these people stop treading all over us? Well done Spitalfields Trust, keep up the good fight. Good luck from Milton Keynes. HURRAH !! Great news. I am lost in admiration of all those who are continuing to fight the battles, and may they win the war. The comment by the judge, that you have told us about, just defies belief, I thought that the high fives that you mentioned before at the decision in favour of British Land was sickening, but this, by a judge of all people, is far far worse. Justice is far too often not seen to be done nowadays but let us hope that this time right will prevail. And send the judge away for retraining on a long long course, he surely needs it!! Donating… full of admiration for those who continue for fight this battle- good luck this time! Makes you wonder how this Judge was chosen to hear the case in the first place. As others have said, I applaud your tenacity and we can but hope for a different outcome next time. even Boris is gone,the fight is still on!!!!!!!!!!!!! GOOD ON YOU! And so we should continue this fight against the injustice of the Jugde who said one thing and then did another. His conclution was rediculous. GOOD LUCK My Friends.